The mastering of handwriting is so essential in our society that it is important to try to find new methods for facilitating its learning and rehabilitation. Up to now, the quality of handwriting was evaluated from the visual inspection of its legibility and not from the movement that generates the trace, although the ability to control the graphic movements clearly impacts on the quality of the writing. New technologies improve existing techniques or enable new methods to supply the therapist with new diagnostic tools and the writer with real-time computer-assisted feedback. In particular, sounds can be used to inform about the correctness of an on-going movement, without directly interfering with the visual and proprioceptive feedback. Furthermore, the dynamic features of sounds make them particularly appropriate means of accessing the spatiotemporal characteristics of movements. Finally, because of their playful characteristics, sounds are potentially effective for motivating children in particular need of such assistance. We will present experimental data suggesting that transforming kinematic variables into sounds might be a relevant tool allowing a therapist to complete the visual assessment of the written trace by an auditory control of the handwriting movement quality. Furthermore, both adults with a proprioceptive loss and dysgraphic children are able to write faster and with more fluent movements with the aid of auditory feedback. 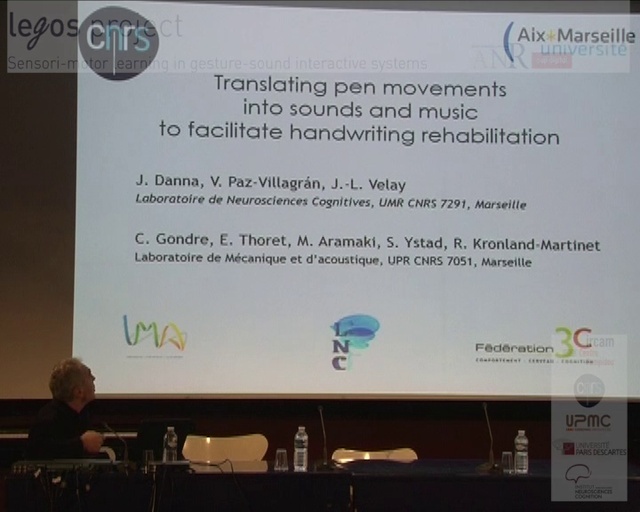 We propose that sounds and music may be used as a palliative way to assist handwriting movement learning and rehabilitation.